ML what do you mean by desaturate ...show us a before and after and i will have a bit of a play. Teejay, in PI, I go to Hue and Saturation and set the saturation to zero which removes all the color and leaves me with a grayscale image. I do that a LOT for the newsletter. I load up a dozen images in PI, then just go through all of them, desaturate, and save. Very fast, very efficient. I don't even have to save because it asks if I want to save the image so I click yes. I can't figure out how to do that in AD. I'm sure you know what I mean without an example but I'll attach a before and after anyway. You can see what I did to my arm today! I got a boo-boo! Ran into the end of a metal railing. Say the same as Teejay! I hope the wound will heal fast! Looks awful and painful. Desaturate: AD/AP adjustment and B/W fast and easy! open a new doc . hope that arm is healing. You aren't supposed to look at my booboo - it's the saturation! I probably should have gone in to the emergency room for stitches but it was really bleeding a lot so I used a few bandaids to close the gap. It's going to take a bit of time to heal because there's a small chunk missing from the center of the crack. Had so many things I wanted to do today but my body is not cooperating. It's "shaky" inside and all I want to do is sleep. Also found a large bruise on my knee when I woke up today. Must have banged that on the metal step. In other words, I'm a wreck today! click it and it will take you to your document set up with all the settings. Ahhh... that works! I clicked on the image, not the document which is why I couldn't find it. It does a very nice job of it too!! I like the results but it's still more awkward to use than PI. The difference is, PI lets me open all the images at once whereas AD makes me place each one. I like that AD auto converts them all to gray scale upon import so those two things even out. In PI, I have to convert each one separately. The biggest problem with AD now would be an efficient way to save each image. In PI, I only have to click "close" to close the entire program and it will ask me if I want to save each image to which I just sit and click Yes and it saves using the same name. 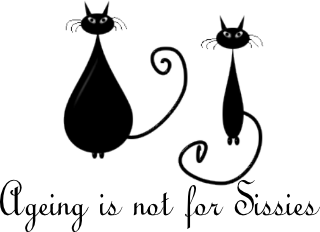 With AD, it wants to save the entire document and not each individual image. 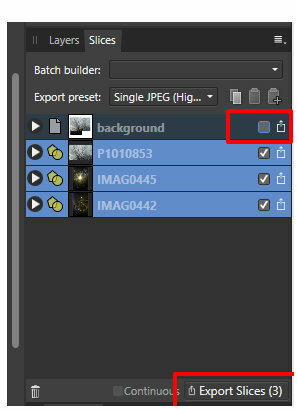 To do that, I have to export, then select "without background" and then give it a new name. If I could find a way around that, it would be nice!! Here's an example of how AD converts an image: The gash is looking better today. I held it together with bandaids until it started to heal. Was sick most of yesterday (jittery inside) but slept almost all day and night. Today, I can type again without pain and am on the mend. there are two ways i know of doing this. both ways bring all the chosen images in one document at once . to export and save on mass and not one at a time. go to the Export persona. next hide the Backround layer . you will then browse to a folder you want to save to and click export ...and thats it all will be croped to the size of the image and saved . Another way to desaturate multiple photos at once: as Teejay said, you can open multiple images at once in an already opened document by selecting them in the explorer and clicking open. You can then desaturate them at once but for that you must group them first otherwise the desaturation will only be done on a single photo. To do this, once the photos are grouped, "Layer", "New Adjusment", select "Black & White", adjust if necessary to adjust. Thanks to Teejay for the one-time export method, I had not yet had the opportunity to export several photos. Teejay, I would like to make a small point about exporting several photos or drawings at once. The method you give is suitable if you want to export all the photos contained in a file. If you do not wish to export all the drawings, once in "Draw Persona" and in the "Layers" tab, select only the photos to export then click on the button "Create Slice". Then go to the "Slices" tab, the photos to export are marked. 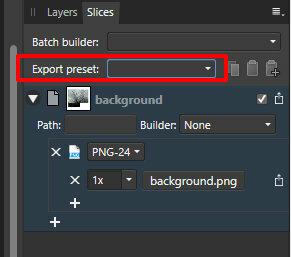 Uncheck "Background" as you reported and click on the "Export Slices" button (the button indicates the number of files created at export). thanks rege for clearing that up. To be even clearer, let's add that we can select several files by using the "Ctrl/Cmd" key in the "Layers" tab and then press only once on the "Export Slices" button, contrary to what I show in my GIF. Thanks again for allowing me to explore these features! OMG. Looks like you need a few stitches in the deep cut MaryLou. Hope you are ok...looks very nasty. Take care as the last thing you want is an infection getting in.